*making a geeky arm muscle* in that the workout of the day is a toughie. 6 miles in <50 minutes (usually between 47 and 48) followed IMMEDIATELY by muscle pump can be a little tiring. And hunger monster making. I pretty much came home stomping around making editorial comments concerning the state of dinner. Which was mostly done. Gah, I can be a total brat. Forgive me. Any of you ever get hangry? 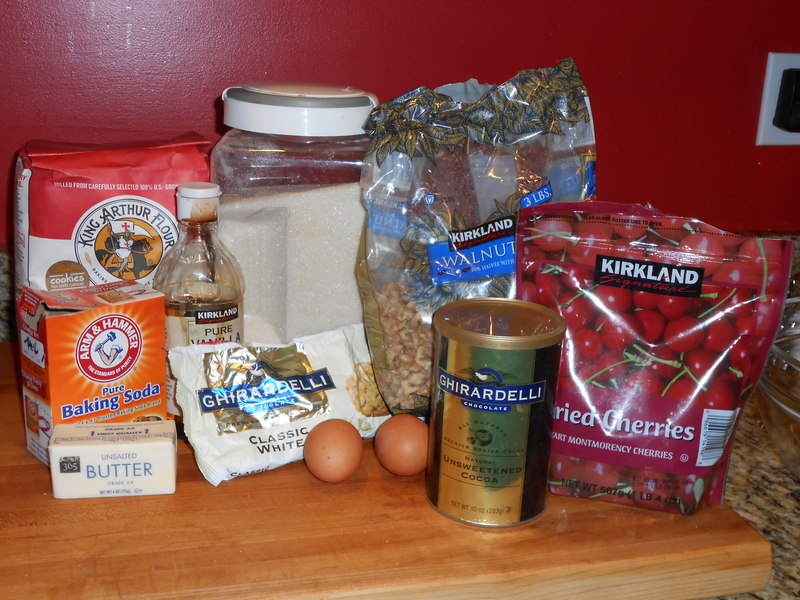 Tonight we have dinner and dessert all together in one post- the Chocolate, Cherry, Chocolate, Chocolate, Walnut…. CHOCOLATE biscotti follow the squash extravaganza. Scroll down for these…. If you want dessert first. I won’t tell. 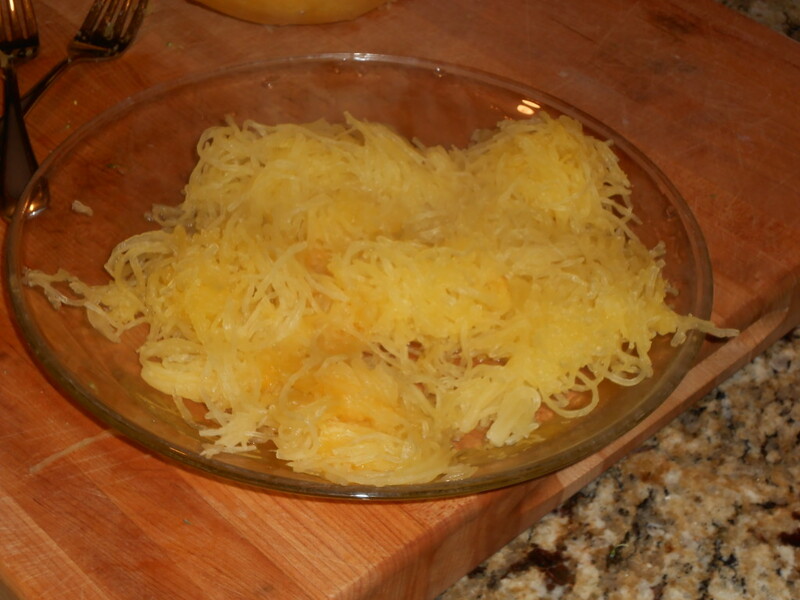 Cut the squash in half, remove the seeds, place face down on a plate, cover with plastic wrap and microwave one half of the squash at a time on high for 7-8 minutes. 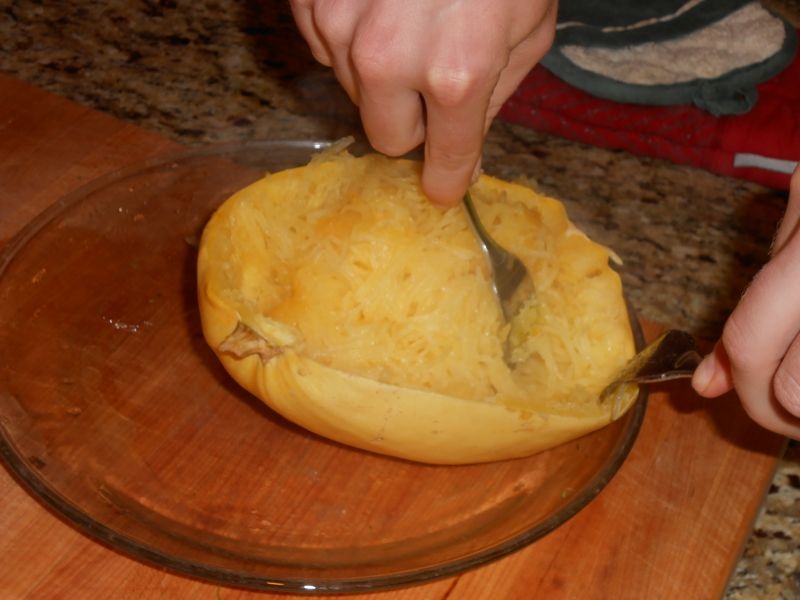 and when both halves are done, scrape the insides out with a fork. It may not be much to look at, but it has great “pasta-like” texture, a lightly sweet flavor, and is a much lower calorie choice than pasta. As in, if we were eating noodles tonight we would be having like 1/6 of that portion. Add a massive portion of pot roast (there isn’t a super huge amount of meat left, FYI), and a side of broccoli- and you have a supremely comforting dinner in which AGAIN we only added 2 new things. Squash and broccoli! This one is a little harder to make pretty- but we make up for it in relishing in an absurdly large portion of dinner. Since it is mostly veggies (and the pot roast sauce is mostly veggies… and I don’t add NEARLY the amount of fat Ina’s recipe calls for), this is health food. 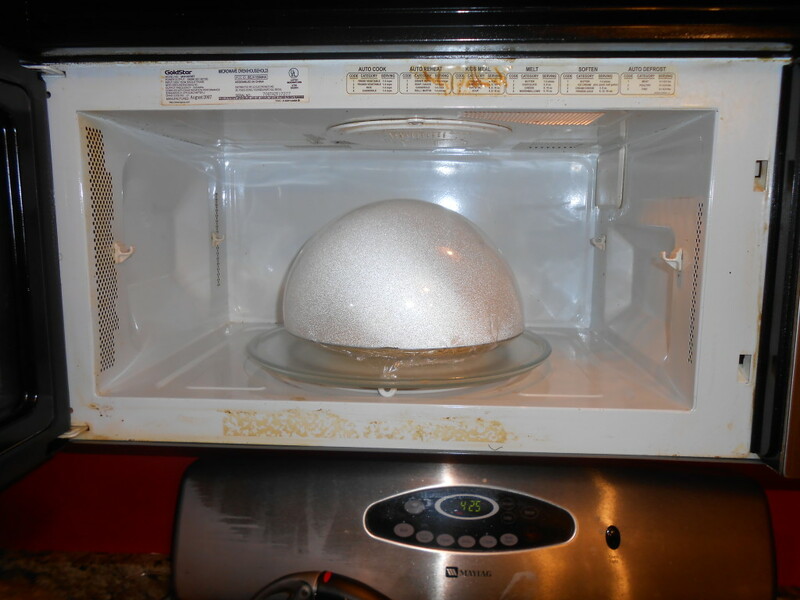 Clean, leftover using, and economical. On to something that is totally NOT health food. 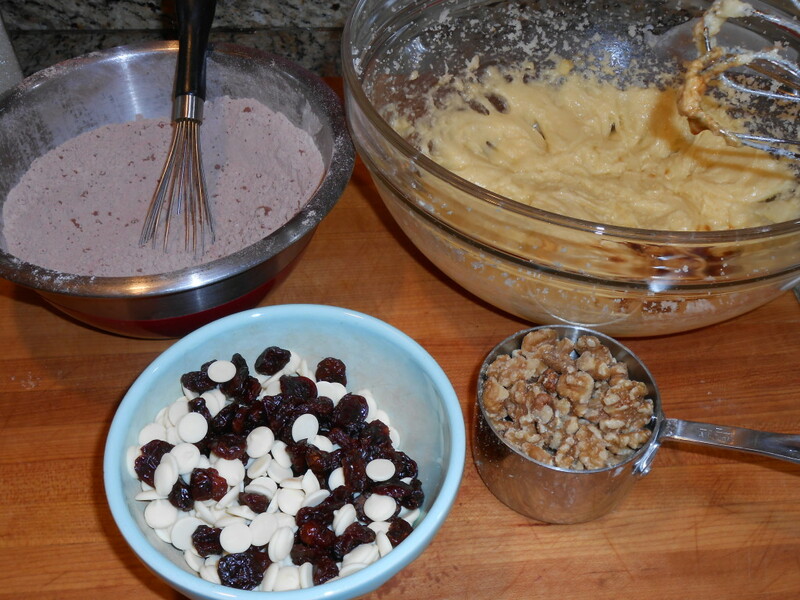 Chocolate, Cherry, Walnut Biscotti. 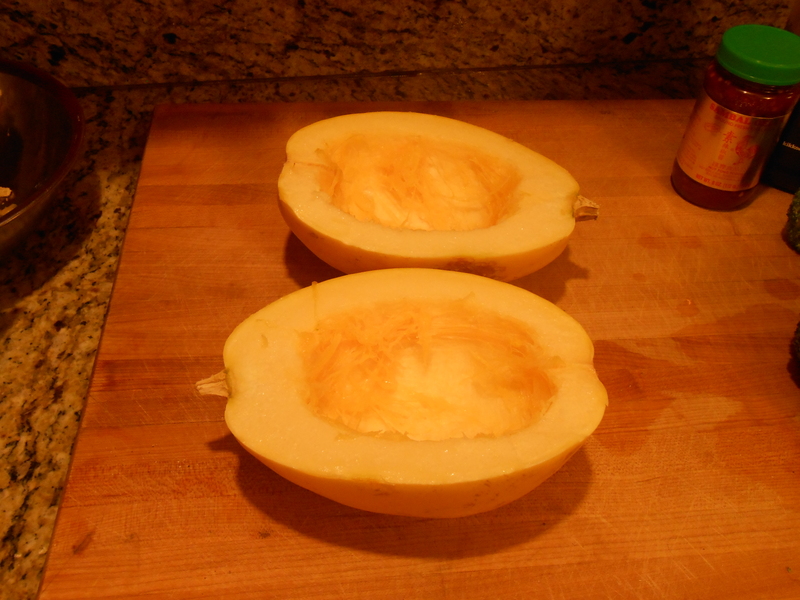 These are dunkable, cut nicely, and were literally GOBBLED up this past weekend! See? not even too many ingredients. 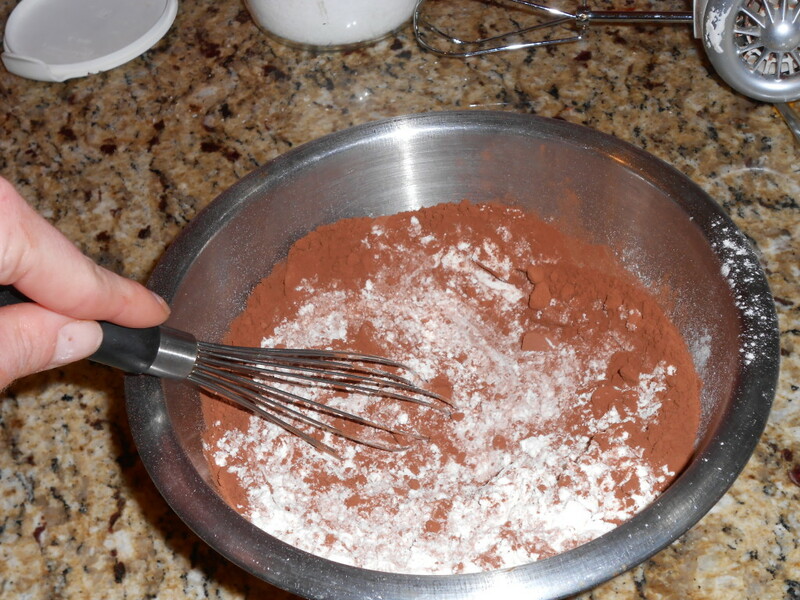 We start with whisking the flour, cocoa, salt, and baking soda together in a bowl. We have then added the 2 eggs, one at a time to the butter, and mixed thoroughly. The dough will come together! Then form it either into one big log (what I did), or two smaller ones. 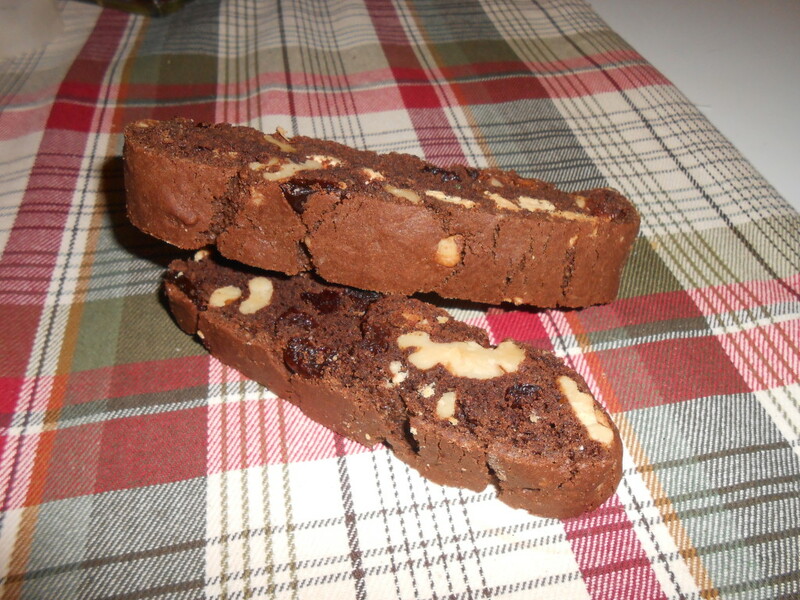 I find that having a nice, large, traditional biscotti makes me happy, so I usually do big logs. Bake the log at 350 for 40ish minutes. Smaller logs would take less time. 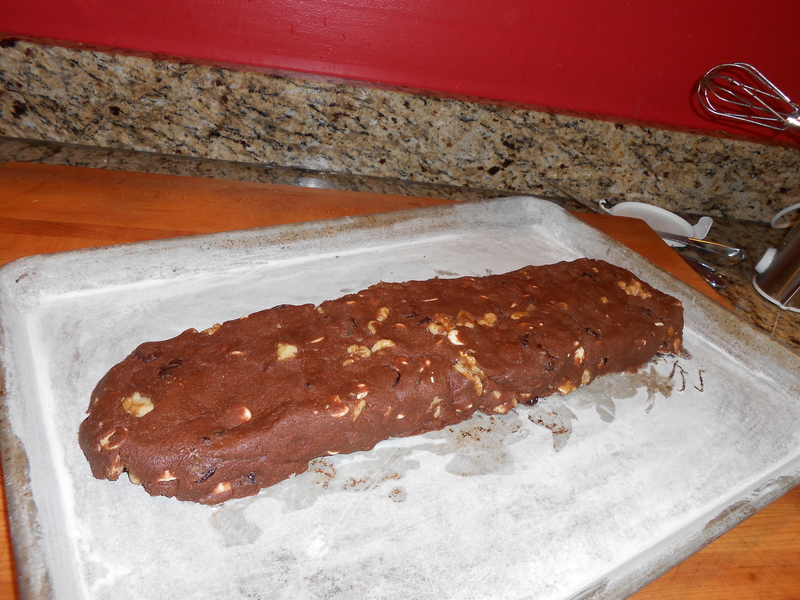 This log is done- cracked through the top, cooked most of the way through, but still moist. Let it cool a bit so that you can slice it into 1/2 pieces. The slices then get baked for another 10-15 minutes, until crispy. 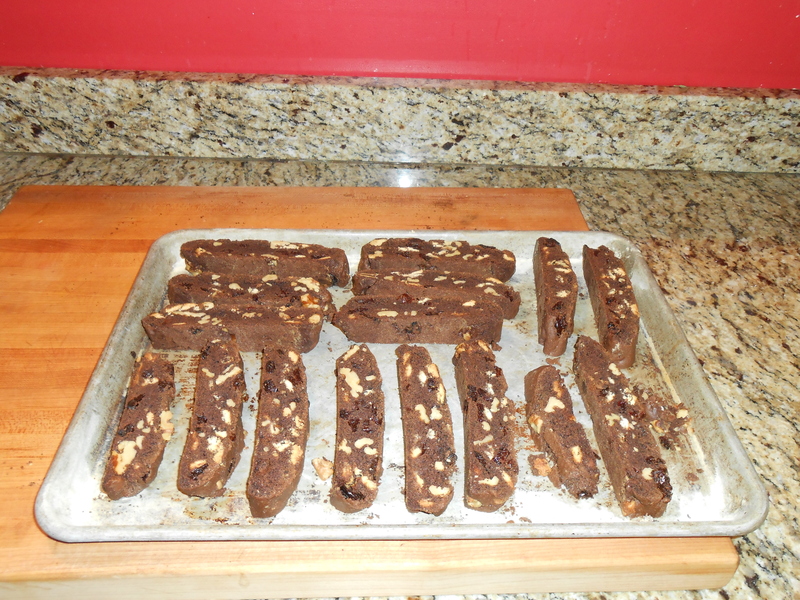 My recipe made 18 large biscotti. If you do 2 logs, you get approximately 36. 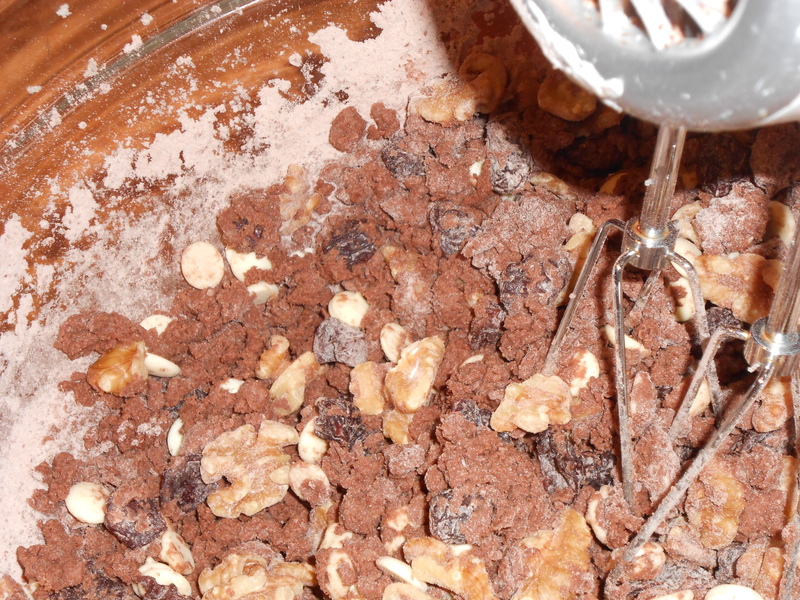 Using an electric mixer (hand or stand) cream together the butter and sugar, until light and fluffy. Add eggs, one at a time, beating until fully incorporated. 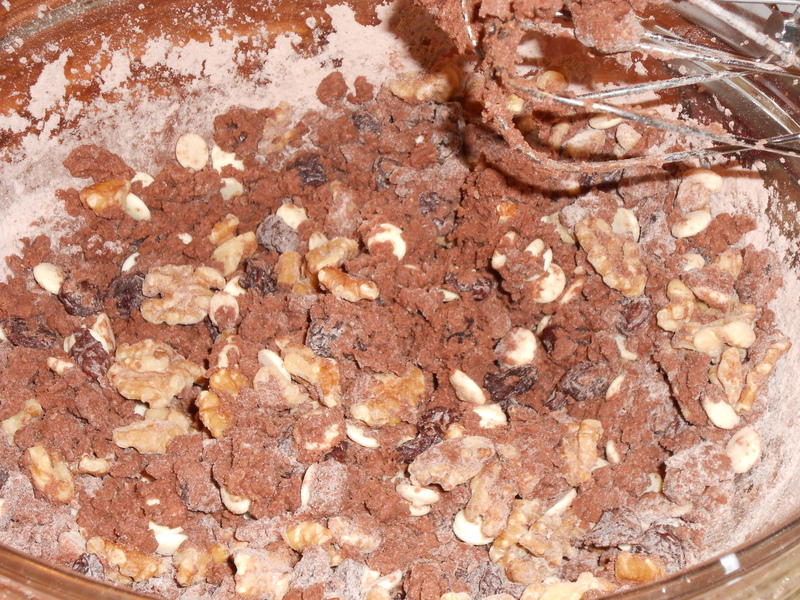 Add flour mixture slowly, as well as chocolates and nuts. The dough will be stiff. Form into one large log, going down the center of your baking sheet. Alternatively, you can make several smaller logs. Adjust baking time down to reflect smaller logs. 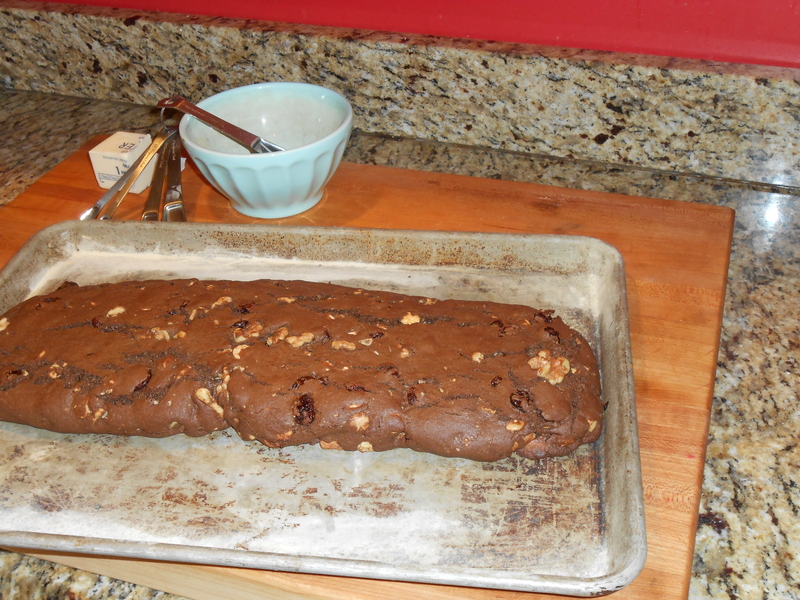 Bake (a large log) for approximately 40 minutes, or until cooked yet still slightly moist. Keep the oven on. Cut the log into ½ slices, and arrange on a baking sheet. 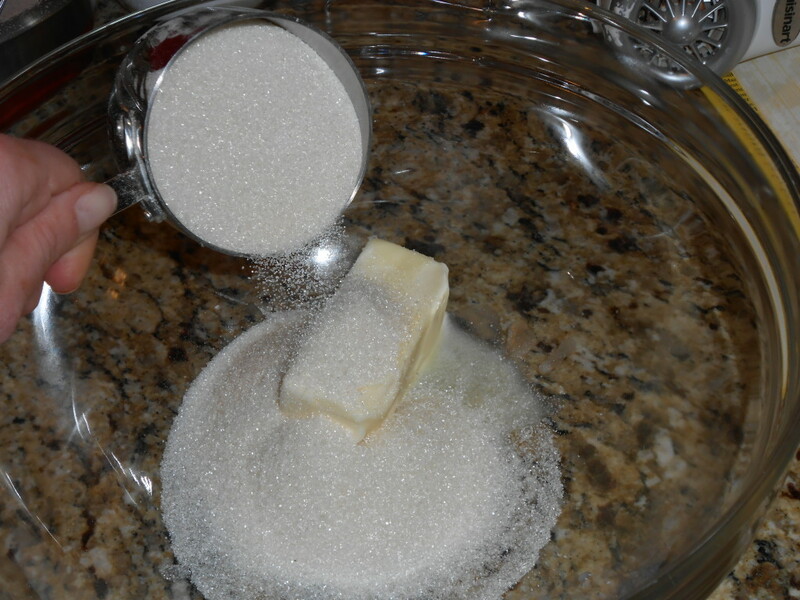 Bake the slices for 10-15 minutes (erring on the side of 10) until crispy. Watch carefully to avoid burning the chocolate. These are REALLY delicious, easy, and travel really well. They can go in coffee, so they are almost breakfast. I ate half of one about an hour before going running, and it was fine! So it is fuel, too! 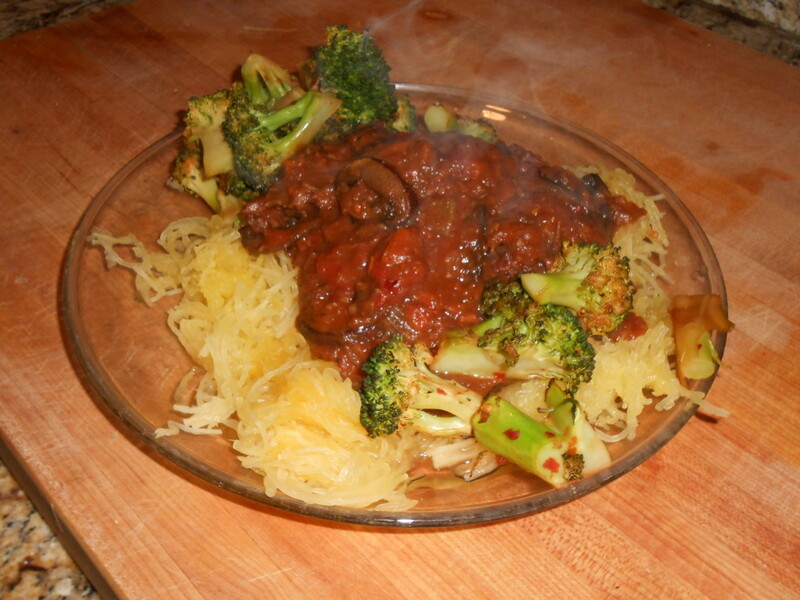 This entry was posted in Cooking, Recipes and tagged biscotti, broccoli, cherry, chocolate biscotti, leftovers, pot roast, spaghetti squash, walnuts. Bookmark the permalink. One Response to Tuesdays are Tough!